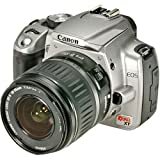 Should I buy Canon 350D or Nikon D50 or Nikon D70(s)? 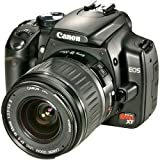 Three great DSLR cameras with great prices.. Which one should I buy ? “The Nikon D50 provides the most consistent and “best” straight out of camera results. The in-camera processing that occurs in the Nikon D50, in terms of sharpening and tone adjustments, produces images that are very pleasing to the eye when viewed straight out of the camera. Ideal for users who want to go directly to print without having to worry about software post processing in a computer. In comparison, the images from the Nikon D70s have a tendancy to look a little flat and softer than those from the Nikon D50, when viewed straight out of the camera. Nikon has adopted a much more conservative approach to in-camera processing with the Nikon D70s, realizing that there are certain disadvantages as opposed to proper post processing with external software applications, such as Nikon Capture or Adobe Photoshop. This entry was posted on Monday, August 29th, 2005 at 8:58 am and is filed under Canon, Digital Camera, Nikon. You can follow any responses to this entry through the RSS 2.0 feed. You can leave a response, or trackback from your own site.